This fashion photography background is so modern that wood pattern, brown color. This modern designer backdrop is made of vinyl cloth, eco-friendly, non-toxic. 1. 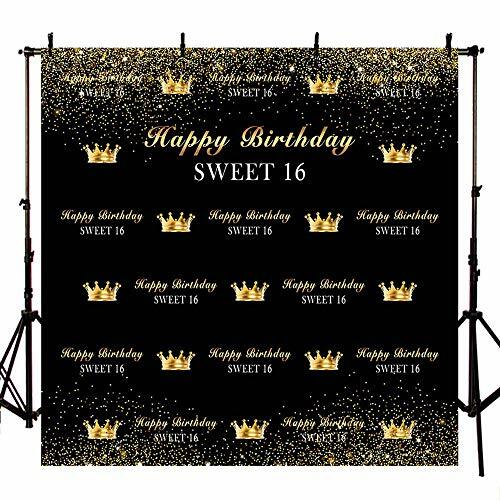 Material and Size:: This backdrop adopt high quality vinyl cloth ,which makes the pattern more realistic. 7x5ft 2. 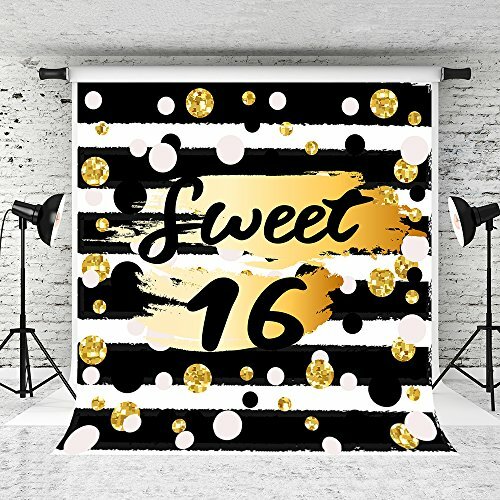 Design: Sweet 16th Birthday Theme, black color. 3. What’s Included: Photography vinyl cloth(folding) ,background stand is not included. 4. Apply: Ideal for wedding, party, newborn, children, and product photography, as well as for video backdrop. 5. Maintenance: The recovery crease method is roll it up tightly with a cylinder and then just waiting for 2 to 4 days. The wrinkles and crease are almost removed. Please iron the back surface with low heat steam iron but not dry iron. 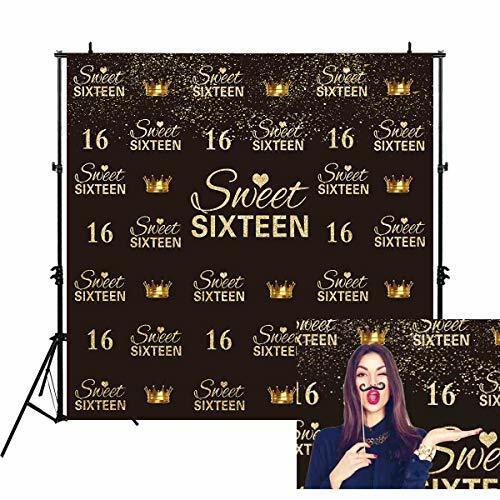 Details: Material: Vinyl cloth Pattern: Wooden Size:7x5ft Weight:0.75 LB What’s Included: Photography vinyl cloth(folding) ,background stand is not included. Notice: ★ All dimensions are measured manually with deviation (ranged) at 1-3mm. ★ Item may be a little different from the picture due to the lighting and your monitor’s display. 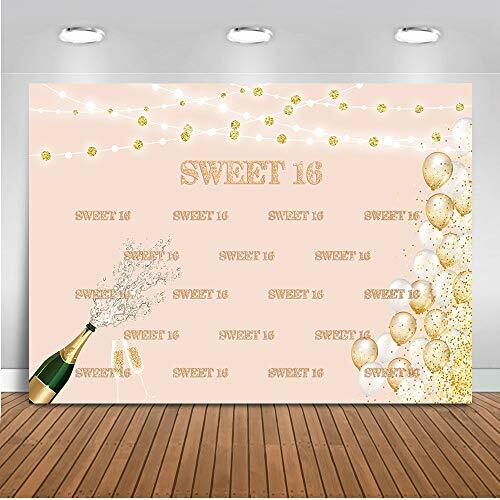 COMOPHOTO 7ftx5ft Vinyl Cloth Photography Backdrop for Photo Studio Photographic Thin Vinyl1.Easy to hang up straightly or naturally.2.The picture is clear,realistic,Stereo sense is strong.3.It's perfect for any professional or private photography. Please note 1.computer screens are different in color correction,subtle color difference is normal.2.At the same time,because of our background material or pictorial ink in different batches,the background when printed will have very small difference.3.All backdrops will send by folded.4.The backdrop are not waterproof.Here are ways to remove wrinkles1.Roll it up tightly with a cylinder for 3-4 days,it will be ok.2.If necessary,please iron the back surface with steam iron but not dry iron.Then it will be smooth again.So if you can not accept,please buy with caution.FeedbackIf you don't satisfied with the transaction, please feel free to contact me,i will reply within 24 hours and try my best to resolve any problems.if you like it,please give me a five-star reviews.Thank you! Material: Thin Vinyl(professional photography cloth). 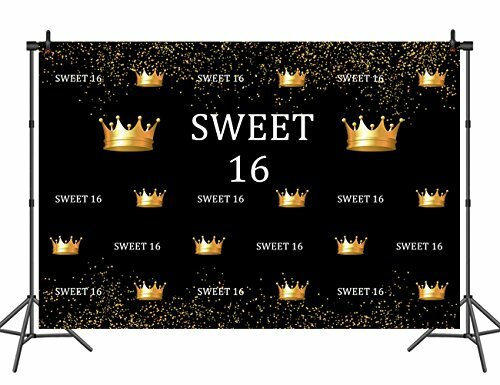 Type: Sweet sixteen 16 birthday banner Photography Background. 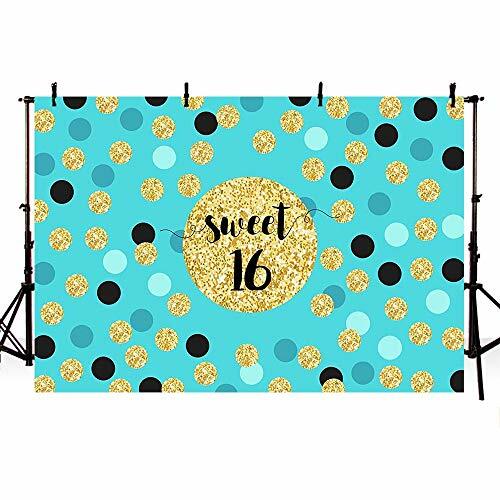 Features: Non-reflective & Foldable & Reuse & Durable & Ironing & Not reflect Light.High resolution, Computer-printed, Not easy fade, Color fidelity, Strong artistic effect stereo sense.Package include:1 x photography background. How to Customize:Please send us your custom information through Amazon message.We will not charge custom fee. Then our designers will make the proof for you to confirm. Hanging Your Drop: Use clamps to hang it on a backdrop stand or a backdrop support system. These do not have a pole pocket. Notes: 1. Material vinyl is not washable.If there are messes just take a damp cloth with water or a gentle cleaner(like soap) and wipe clean. 2. Item will be sent by folded, easy to carry and keep clean. About the creases, the followings are the methods to remove creases. 1) Roll it up tightly with a cylinder, and waiting for 3-4 days. 2) Iron the back surface with steam iron with low heat but not dry iron. 3.Please keep in mind that all computer screens vary in color calibration. Package Note: Background Stands or Lights not included. Package List: 1x Cotton Photography Backdrop(Folding). Features: 1.Compare to vinyl or other material,No wrinkle,No reflective,Light-proof. 2.Digital Printed,pattern is realistic,stereo sense is strong. 3.It could be washed and ironed if backdrop is dirty. 4.It could be used at any time,do not need buy it every year. 5.It is Seamless for any big size if you order. About Shipping: 1.Shipping time:Usually 2-3 days. 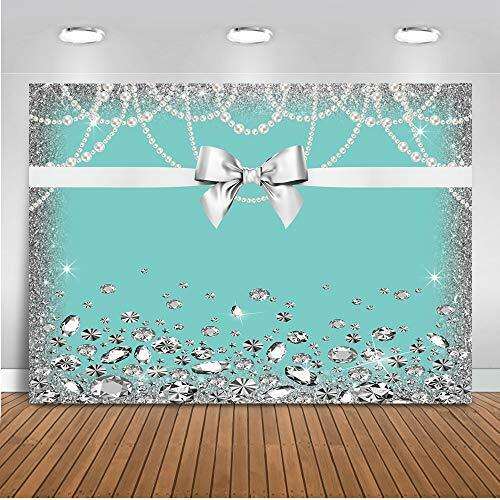 2.if you do not receive backdrop for long time,please contact us firstly. Product Note: 1.Due to facilitate transport and packaging,if have wrinkles,Please hang to dry after washing with warm water or iron it. 2.Computer screens vary in color calibration,Maybe differences between real and pictures. 3.It is better that keep some distance when you take pictures. Customized Way: 1.Please tell us the size that you need by message,it is free. 2.Please send the pattern that you want by message,it is free. Dear customer: Have any question,please feel free to contact us firstly. Thank you! This is a how-to video to demonstrate how to set up a double curtain Backdrop and how to pin back sections. For questions feel free to give us a call! 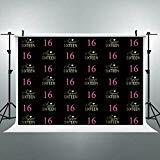 To see a video demonstration on how to set up a single curtain backdrop set up view our other videos.